Consequential LCA studies the consequences of a change in demand for a product or service, and for this reason only marginal suppliers are considered in the system. However, identifying the marginal suppliers of electricity may present a number of special challenges because this requires not only knowing the local production capacity but also to understand the energy regulation and politics affecting the current and future regional and local electricity production. This example discusses the situation in Denmark in 2012. The available electricity suppliers and their power generation in Denmark are shown in table 1 below. Data for year 2012 are obtained from statistics by the Danish Energy Agency and the electricity generation for 2020 is obtained also from projections made by the Danish Energy Agency (Muñoz et al. 2015). The data on predicted power generation is very important since LCA generally is used for decision support related to decisions that have long-term implications. Therefore the relevant marginal supply is the long-term marginal supply, not today’s supply. Long-term marginal supply is sometimes also referred to as the ‘build‐marginal’, i.e. the technology of the capacity to be installed next. 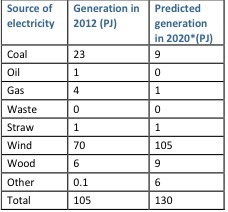 Table 1: Data for power generation in Denmark 2012 and 2020. Based on data from the Danish Energy Agency (2015). Source: Muñoz et al. 2015. There is an increasing demand for electricity in Denmark. This market situation helps us to focus on some of the suppliers from our list, namely those suppliers that are based on a modern, competitive technology and can react to the up-ward change in demand with a capacity adjustment. Strictly speaking, modern technologies are defined here as those that grow above the replacement rate of capital (figure 1). Figure 1. Borderline between “modern” and “old” technology. As can be seen in table 1 the Danish Energy Agency predicts that wind, wood, and other renewables (solar) will increase capacity while coal, oil and gas are predicted to decrease. It is important to ensure that the proposed marginal suppliers are not constrained i.e. due to limitations on available raw materials or due to political restraints. In Denmark this is not the case as there are political targets for 2020 and beyond in place to increase the proportion of woody biomass as well as the solar and wind energy. Based on this information, the suppliers in Denmark with a predicted increase in capacity are wind, solar and biomass (covering waste, straw and wood). This means that wind, solar and biomass constitute the long-term marginal electricity consumption mix, whereas coal and gas are not part of it. To calculate the actual electricity mix we need to calculate the share of each marginal supplier respect to the total change in generation in the assessed period of time, at the same time taking into account the capital replacement rate, which is different for each technology (NREL 2010). Table 2: Calculation of the long-term marginal electricity mix for Denmark, based on generation shown in table 1. 1 Taking generation in 2012 as 100%. 3 Calculated as the inverse of the plant lifetime, with a minus sign. 4 Calculated as the annual growth 2012-2020 minus the capital replacement rate. 5 If the annual growth is lower than the capital replacement rate, the technology is considered as old. 6 Calculated as the generation in 2012 (in table 1) times the net annual growth. This supplier mix is interesting given that we often see that coal and gas are attributed leading roles in many databases, despite the fact that many countries are actively reducing or phasing out these technologies. As an example all EU countries have made explicit commitments in this direction (see EU’s renewable energy national action plans: http://ec.europa.eu/energy/en/topics/renewable‐ energy/national‐action‐plans). Not adjusting for these political commitments in our models would lead to flawed results and potentially wrong decisions being made.